This week I was reminded again of how thankful I am that my Mom taught me how to sew. My Grandma taught my Mom how to sew. 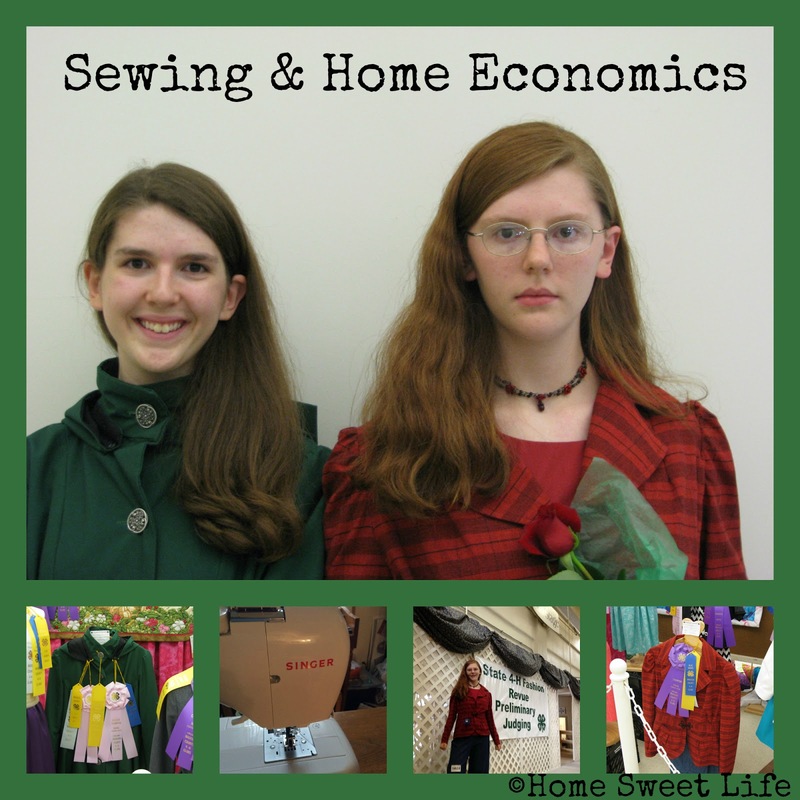 Grandma was a Home Ec teacher, and her Grandmother had been a seamstress. I am thankful to be able to continue this tradition of learning to sew with our own daughters. Our girls both sew for 4-H, and occasionally just for fun. 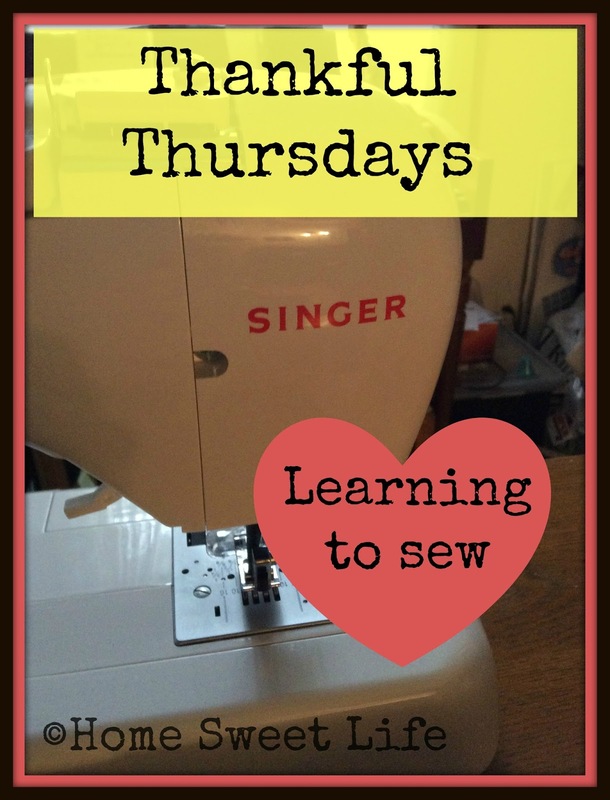 Several people over the years have told me that they wish they knew how to sew. Others have told me that they never learned how and did not want to learn. There are so many different things we could spend time having our children learn. It can be difficult to choose at times. I am thankful for the opportunity to teach this valuable skill to our daughters Emily & Arlene. I do not know how long they will continue to sew after they leave home, but I am glad they know how. My Dad used to tell stories about how he earned some cash while at college sewing buttons back on shirts for the other men in his dorm. Apparently Dad's meager skills at buttons were far above those of the other guys, and they were happy to not have to purchase a new shirt. Do you know how to sew on a button? Perhaps you've learned how to hem a pair of pants or a skirt? These are valuable skills. They come in handy often. I am so thankful our girls are learning to sew. They do a better job than they think they do! 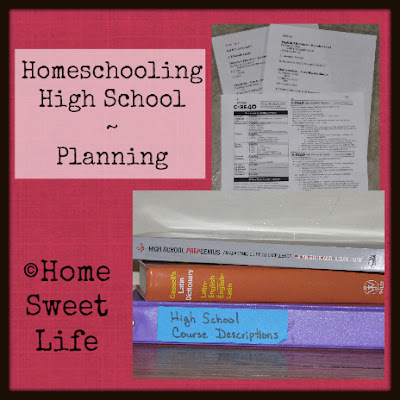 Most people think the first step along the way to Homeschooling High School is to have a plan. 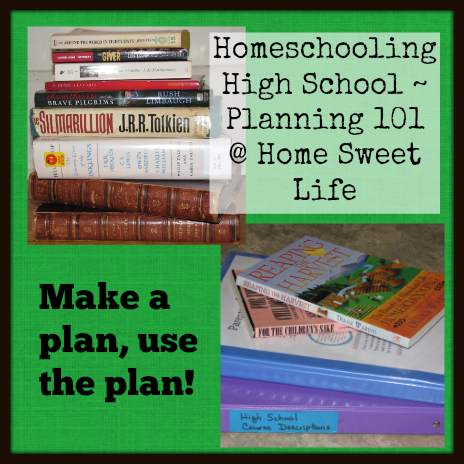 Actually, the first step is to decide you are going to Homeschool High School, the second step is to make a plan, and the third step is to have that plan, follow it, and tweak it along the way. 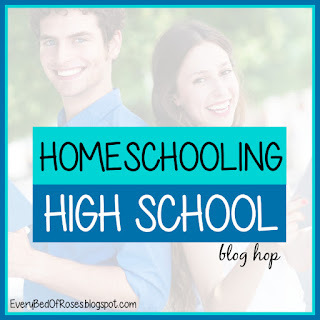 Since you've come to read this installment in our Homeschooling High School Monthly Blog Hop, I'm guessing you've already decided yes to the question of whether or not to Homeschool through High School. Good for you! You have just made one of the toughest, yet most life-changing decisions, along this path of parenthood. Now let's move to step two and think about making a plan. First up you're going to want to print out copies of your state's laws and High School Diploma requirements. These vary so much from state to state that you NEED your own printed copy to refer back to again and again. 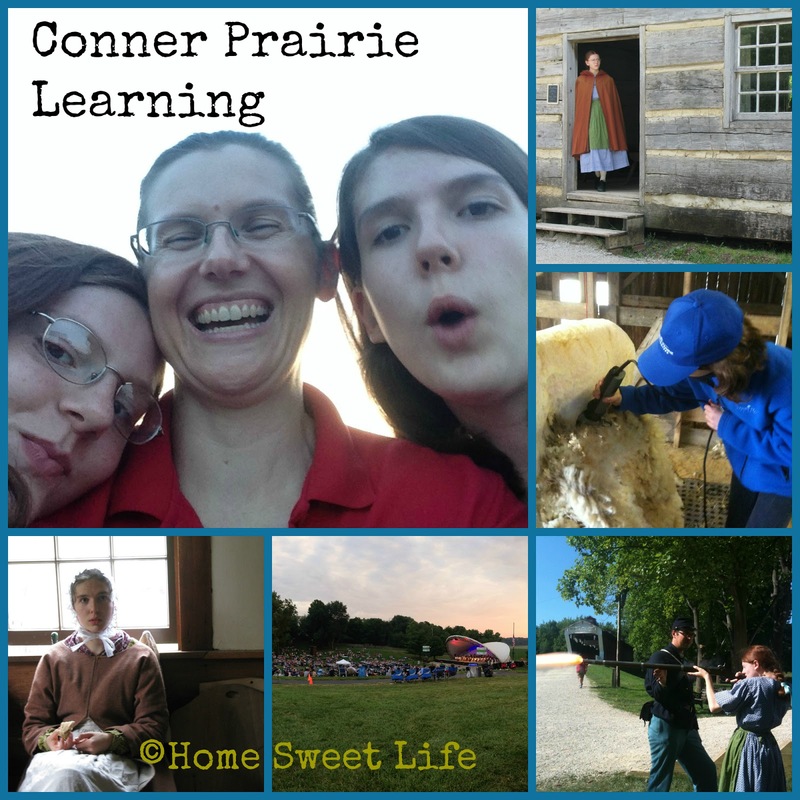 We currently live in Indiana, a fairly easy state to homeschool in, where the actual requirements are few for the day-to-day part of homeschooling. While this has been wonderful as the girls have grownup, once they got to High School age, we wanted to make sure they would be getting a diploma that could roughly equate to one from the local schools. This didn't mean we changed our philosophy, or how we approach education, it simply meant I needed to spend some time looking at what a standard diploma required, and figuring out what we wanted to do. Indiana currently assigns a credit for each semester of High School level work, and the basic diploma issued is called the Core 40 diploma... thus there is a list of what those 40 credits should contain. Some are electives, some are specific (directed) electives, and most fit into the courses you would typically expect in High School - like math (6) credits: (2) credits in Algebra 1, (2) credits in Geometry, and (2) credits in Algebra 2. Any additional math classes can go under additional math credits, or possibly electives - it's expected that most students will have more than 40 credits when they graduate! My goal in mapping out a plan for each of our daughters was to make sure they take courses that they need, while also fitting in as many of the ones that they want as well. To help me see what the local school might be offering, and what scope those classes usually covered, I found a PDF put out by the state Department of Education to help local schools label their courses. 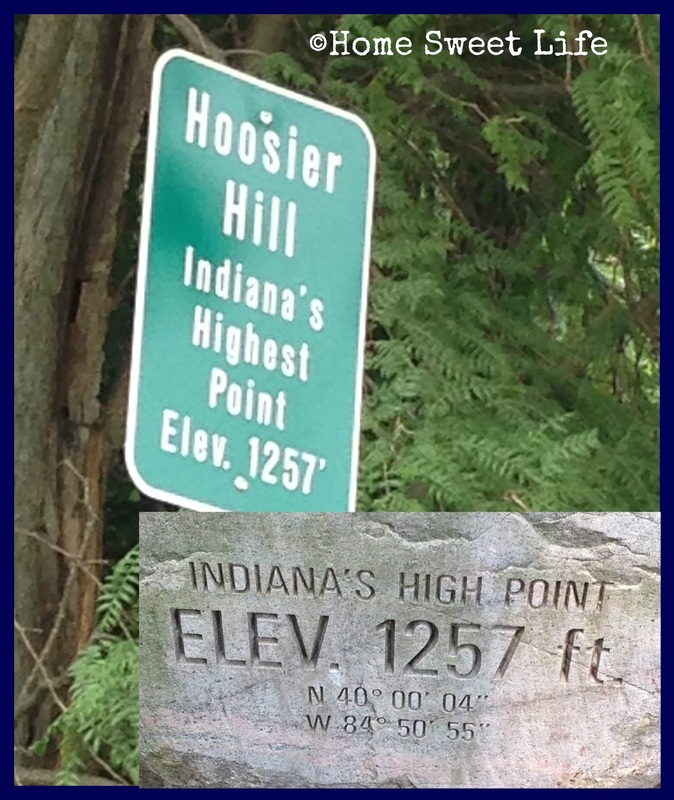 It is called Indiana State Approved Course Titles and Descriptions. I sent it to the local print shop, where they printed it out double-sided and three hole punched it for me. At 288 pages, I didn't want to tackle that task at home! I keep this in a three ring binder, along with the Core 40 requirement pages, and my general overview pages for each of our girls. If you're been following us for a while, you'll remember that we are not traditional book-based learners, we are much more eclectic! We have always followed a Charlotte Mason philosophy of Living Books, nature study, and outdoor play. We also LOVE field trips! I sum this all up as Eclectic Experiential Education. While many people think that has to all stop when your children enter High School - let me assure you - it does not! Yes, our girls do use textbooks more now than in elementary school, but they control the textbook, not the other way around. The textbook is the spine, and the activities and learning are the focus. We use the state guidelines to help decide what to call each credit on their transcript, not to tell us what to do for High School . Let me give you an example. When I went to High School (public school,) my art classes were listed as Art 1, Art 2, Art 3, and Art 4. Pretty basic right? Now our state has delineated what each credit is listed as by the subject and medium matter. The broader art category now includes dance, band and chorus (which used to be listed under non-art electives,) as well as traditional art-subjects covered like: photography, drawing, 2D art, ceramics, painting, printmaking, studio art, and sculpture. Also in the Arts category are: acting, theatre, musical theatre, and art appreciation. The times have changed, and I want to make sure to list Emily and Arlene's credits on their transcripts in a manner similar to what other local graduates will receive. Since Emily only need 2 actual credits in Fine Arts for the directed electives section of her transcript, the other credits will go under general electives. She currently has art credits in: Theatre Arts, Drawing, Art History, Advanced Acting, Photography, Music Arts and Appreciation, and Fiber Arts. She is currently working on credits in Piano and Electronic Keyboard, and Beginning Chorus. I expect her to have an additional credit in either Acting or Theatre Arts before she graduates. Arlene is younger, but still has already accumulated many art credits: Fiber Arts, Painting, Drawing, Photography, Theatre Arts, and Acting. So what about the traditional classes? Those can be as simple or complex as you want to make them when you’re planning out High School. Here is a tip - make them simple! It is so easy to go back and add things to your student’s list for the year, but often difficult to take something major out and find it a suitable home in another year. So start with a general plan. If your student needs 6 semester of science (like we do) and 2 semesters MUST be Biology, then have them do Biology their 9th or 10th grade year. Don’t put it off too long, especially if it needs to be a lab science. We wanted Biology to be one of the two lab science courses for both of our girls, so I needed to decide when to have them take it. Even though they are only two years apart in age, we chose to not have them take it at the same time. Emily has already finished Biology, but Arlene will probably not start it until at least late this fall. When Emily needed another person to do labs with her, either Arlene stepped in for the day, or we met w/ friends whose daughter was also taking Biology at the same time. I have no qualms about Arlene getting her labs done for Biology because she loves, loves, loves to be outdoors, and to explore things. Arlene will probably dissect plants instead of animals for her labs, but with all the resources available online, we can watch some dissections together. There are two points I want to cover that I get asked about quite a bit when it comes to Homeschooling High School. 1- How do you choose which curriculum to use? 2- How do you assign credits when you’re using living books and field trips instead of a standard curriculum? Let’s start with #1. We are NOT traditional textbook style learners, but we do use textbooks frequently. Let’s face it, just because I COULD teach the girls all of their math courses one concept at a time doesn’t mean I want to. We have been fortunate to review quite a few High School level curriculum items as a part of the Schoolhouse Review Crew. Many of those have been worked into our overall plan for High School. For other subjects where I wanted at least a spine of a text to work from, I researched. How to best research for High School? Ask your friends (in person or online) who have homeschooled High Schoolers. Seriously, just ask. I’ve let friends look through our books, as well as having skimmed my friends’ shelves for titles that I thought might interest me. This is a prime time to set aside some money to attend a homeschool convention. Being able to look inside the books that are competing for your money and time, while asking questions of the authors, or fellow homeschooling parents who have used the curriculum that are helping man the booths, can really give you insight into HOW a curriculum works in the day to day of life. You might love the idea of how QRS brand history interacts, but if you find out that it takes hours of prep work each week by you the Mom, you should probably look for something else for High School. First, I made a broad list of what I wanted the girls to cover during their 4-ish years of High School. Then I worked on what we already had resources for and pencilled it into those years. Finally I looked at what I needed to purchase or acquire for each school year and made a budget. If I knew the curriculum I wanted to use was too expensive, I looked for used copies, or I changed my mind. One year we didn’t need to purchase any major curriculum ( thanks to review items,) so I went ahead and bought the next level of math that each girl was going to need early. Please know that you do not need to purchase curriculum to get through High School, but a little bit does REALLY help. There are thousands of available online resources, plus books you can get at your local library, or through inter-library loan that can totally cover everything your student needs. Just know that if you go the free to almost free route YOU the parent will be doing a lot more of the work to get it all organized! I have held a job outside of the home for all the years we have been educating our girls at home. That job is not just for fun things, that income helps keep the lights on and the refrigerator full. I am blessed to work at a job with flexible hours, and that makes Homeschooling High School easier, even if I miss sleep sometimes. Part of the reason we have chosen to use some purchased curriculum is because there are certain subjects the girls can do almost completely independently. That leaves me more time to help as needed with the tougher subjects, like chemistry or Algebra 2. Now, for point #2, How do you assign credit when you’re using field trips and living books, I’m going to give you a brief look and then refer you to a post I wrote for the Schoolhouse Review Crew Blog for more details. The quick answer is: easily. Ok, I realize this will be harder to do in some states, but it’s not impossible. If you went to public school growing up, let’s think back for a minute. How many of those textbooks did you actually finish? Me? I can’t remember actually finishing any book except the ones we read in English class. Secondly, how much time did you spend in class actually learning something new? I went to a school with 55 minute class periods for 180 days each year. That means I was supposed to be in class for 165 hours each year. Umm… convocations, pep rallies, snow delays, taking attendance in every class every day? Yup. All those things happened and shortened our class time. I’ll hazard a guess that we had 120 hours of class time per subject each year. So about 60 hours a semester per class. I use this as my rough guideline to decide when they girls have accumulated enough hours spent on a subject to give them life-hours credit. For their Fiber Arts credit, we used the fiber section in ARTistic Pursuits’ Sculpture Technique: Model, which took about 25 hours. Then I had them read a couple books from the library about textiles in history, and talk with the historic clothing and spinning/ textiles staff at Conner Prairie, where they volunteer. They each wrote a short paper about the history of textiles, and then spent time spinning wool on their teams at Conner Prairie. This all added up to WAY MORE than 60 hours. The girls have also earned credits for Theatre Arts and Advanced Acting during their hours volunteering at Conner Prairie. It’s one thing to portray a character in a written play, it is even more challenging to take a brief bio sketch and create that character and then portray her amongst the other people in town. We also plan to credit Emily in either Life Science, or Life Science- Animals for her hours spent caring for the animals in the barn at Conner Prairie, where they feed, care for, and clean up after them, all while interesting and explaining them to guests. To read more about this somewhat usual way we assign credits, click on over and read my post: Putting Experience Based Learning on a Traditional Transcript. I just want to remember to mention a terrific resource to help you sort out and keep track of High School~ High School Prep Genius: An Academic Guide to Excellence by Jean and Judah Burke. This gem of a book helped both Emily and I to better understand what to cover, and what records to keep for High School and beyond. Even though not every student will want to go to college upon graduation, it is up to you as a parent to keep good enough records that they can go if they feel called. If they decide on another family or career path after High School, it won’t hurt you to have a log of their volunteer hours or course of study to refer back to if needed. Be sure to read all the other posts about planning for High School, and join us next month for a focus on Electives! 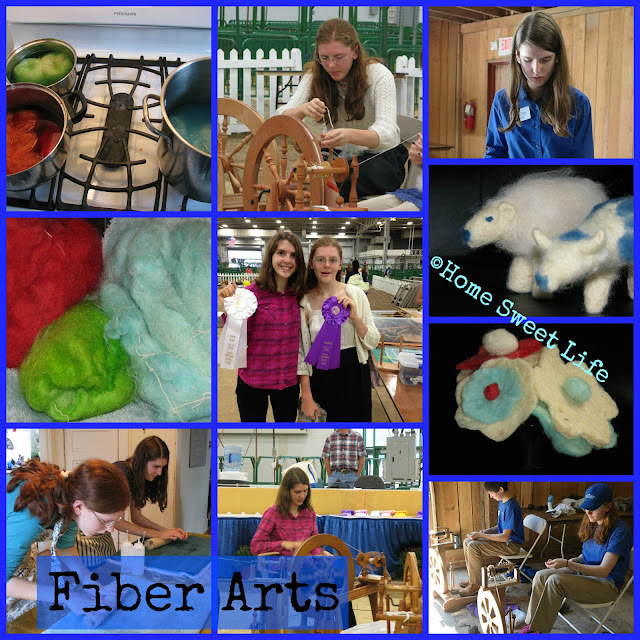 Electives, electives…our favorite things… oh wait, field trips are our favorite things! You need to come back next month to find out how we combine field trips with other resources to have a blast getting our electives done! Arlene grabbed the book and disappeared to her room as soon as possible after we received it. She had really enjoyed reading Thick as Thieves, and was hoping this book will fill her in on some of the background of Andrea Carter’s past. I just want to take a moment and say that I also really enjoyed reading all of these books by Ms. Marlow that we have reviewed! She also wrote Badge of Honor, which we reviewed quite a while ago. As a parent, I know it can be difficult at times to choose quality books for your young readers. We have found these books by Susan K. Marlow to be wholesome and fun to read. The characters face real problems, where they need to make a decision about the best path to take. I am encouraged that this newest addition to the Circle C family keeps up the tradition of choosing to follow God and obey your parents without sounding preachy. Inside this 150 page softcover book are sprinkled a handful of pen and ink style drawings portraying Andrea and her young life. 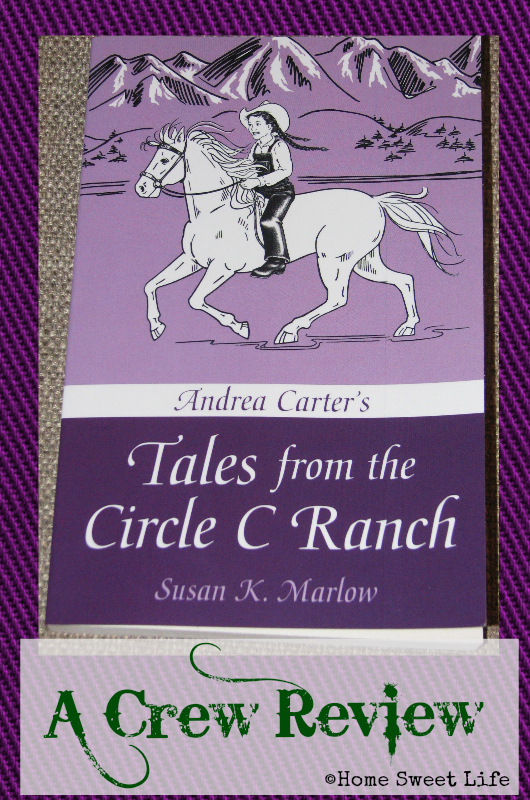 Tales from the Circle C Ranch is an overall satisfying book. I imagine those who have read all of the Circle C Beginnings and Circle C Adventures books are ecstatic to read about the in-between parts. Arlene really wanted to do this review on her own, alas, I had to include all the technical things, but I saved the bulk of the review for her. She also made our graphic, hope you like it! This book is not like the other Circle C books, because it is not one long story but a book of short stories. Ms. Marlow wrote these stories to answer questions that readers sent her about events that are mentioned, but not told about, during and between books. These stories are chronological and the first one starts the autumn before the first book of the Circle C Beginnings and the last one takes place just before the last Circle C Adventures book. These stories (there are 11 in all) cover everything from 1. how Andrea first got to wear overalls, despite what society (and Aunt Rebeca) said, and how it helped her overcome the sadness of losing her father 2. Buying a birthday gift for her mother, despite of only having 12 cents, 3. A visit from her least favorite aunt, and the tragic ending of her Aunts gift, 4. Her first taste (literally) of snow, and helping choose a Christmas tree, 5. Her brother Chad’s crazy horse, that proved to be not so crazy after all, 6. How she raced in public for the first (and last) time, because of her brother’s injured horse, 7. How her two oldest brothers defended the honor of their sister Katie, with less tragic results then might be expected, 8. How she stole her friend Cory's snake, and in the process first met Miss. Hawkins her brother’s future wife, 9. How she recovered from being held hostage, and gave Virginia her first riding lesson, 10. When she went to Washington territory to visit her friend Jenny Grant, and overcame her fear of large bodies of water, and 11. How she got rid of her sister’s evil courtier Jeffery Sullivan, after many failed attempts. It is a wonderful read no matter where you are in reading the other books in any of the series. At 150 pages the book may seem long but the stories are short. However they are no less fun and make great read aloud or bedtime stories. I concur! This book would make a great addition to your Circle C book collection. At only $7.99 plus shipping, why not get your copy today?! Even though Arlene, who recently turned 15 is a little old for lapbooks, we wanted to share just a little about the marvelous resource that it is. It includes basic instructions for making your lapbook out of folders (just in case this is your first time making one,) and then has a section relating to each of the 11 short stories. For each section, there is a page of additional information, such as what little girls actually wore in the late 1800’s or the three main types of saddles. Then there is something to cut out and attach to your lap book. Some of these are mini books, others are for writing things down. At the end there are four of the pen-and-ink style drawings from the book for you to color yourself. This lapbook would make a great addition for any family who loves to learn about the West. To hear what all the other Crew reviewers thought of this book, and to see those who children used the lapbook, click the link below. 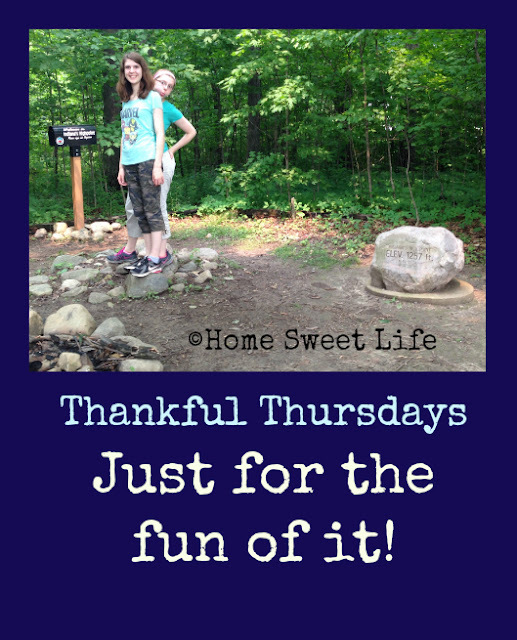 Thankful Thursdays ~ Just for the Fun of it! Last week we went on a field trip with our friends (more about that soon in our Road Trip feature.) Before we came home, we took a side trip - just for the fun of it! There are many times when we have so over-planned our lives that there is not time left for spontaneity. That's just a part of life we have to find a balance in. We try to take that road less traveled as often as we can, knowing the girls will only be at home a few more years. On our way to the field trip destination, we saw a sign that pointed out of town and said "Highest Point in Indiana." I'll admit we got lost on the way, and took a couple more miles than we needed to get there...hello, how did we end up in Ohio?! Let's look at the map on the phone and get back to Indiana. But, eventually, we found it! Find something to do with your family this week - just for the fun of it! Be thankful for time spent with your family! Summer officially starts in about a week, but for most of us, school is out for the summer and we want to take full advantage of our free time to explore. There are so many cool places to visit across the USA, and we would love to share ideas for a good old-fashioned Road Trip with you. Since there are still places we haven't been, at the end of each post we'll include links to great destinations our friends have visited. If you live in the Midwest, the Deep South, along either coast, or somewhere in between, we invite you to come along on a road trip with us. If the destination of our Road Trip is an annual event, we'll plan to tell you about it at least two weeks before it occurs again, so you won't miss it and have to wait a year! Whether you are young or old, a single or a family, we hope to encourage you to plan for, and take, some old-fashioned road trips this year. Our goal as parents has always been to focus on experiences over things. We would rather go somewhere together than buy the latest toy or trinket. 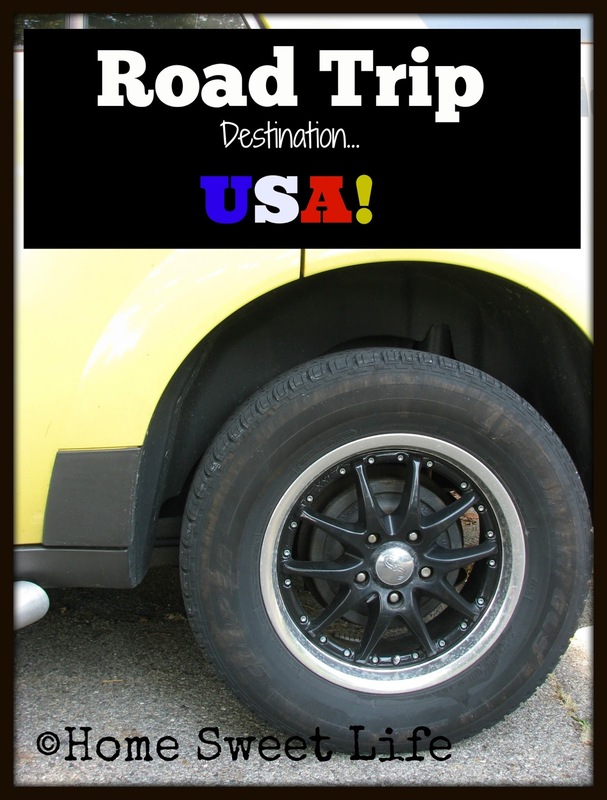 Our Road Trip destinations will often be for free or low-cost locations. We understand needing to stick to a small budget. We also know that a small budget doesn't mean always staying at home! Every once in a while we'll throw in something really unusual. We'll be sharing places we've loved, and trying to give you a plan for adventure, the rest is up to you! Road Trips require a good attitude, a full tank of gas, and a bag of snacks to throw in the backseat. While you're waiting for the first destination, be thinking about getting yourself, your family, and your car ready for the trip. Take an hour and clean the mess out of your car, make sure there's a first aid kit available, find everyone some sturdy walking shoes and a hat, and charge your camera batteries! Who's ready for a Road Trip?! Don't miss a single post, sign up to follow us by email, on Facebook, or Pinterest! Moms, especially home schooling Moms, often feel the pressure to do more. Keep a cleaner house, make more creative meals, post more pictures on social media, read more books to your children, lose 5 more pounds...the list goes on and on. Mamas, You need to take just a little while to learn the Joy of Doing Nothing. The joy of doing nothing does not mean taking the entire day and staying in bed eating bonbons, this is intentional time carved out for your re-creation. Moms are often overwhelmed and the best remedy is spending a few minutes just doing nothing. Just sit. Stare at a flower, or close your eyes and listen to the ice cream truck troll through your neighborhood. Whatever you choose, this needs to be a few minutes each day where you require nothing of yourself. This takes practice, and it takes trust. If you're a tightly wound spring, it may take several days to learn to sit and be quiet. It may take you even longer to trust that God is in control and watching over your family... even when you put down your pen or mop. Stop doing and just be for a few minutes. Be intentional about taking just a few minutes to rest, like 5 or 10. 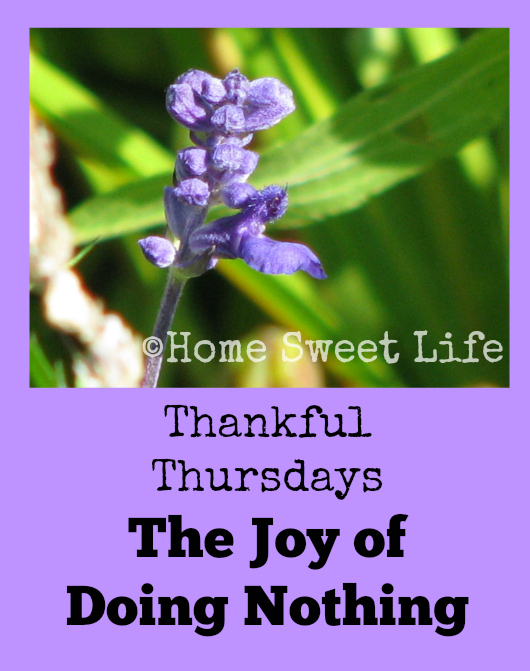 This learning the joy of doing nothing can lead you to a lot of places. Hopefully it will lead you to trust God more. 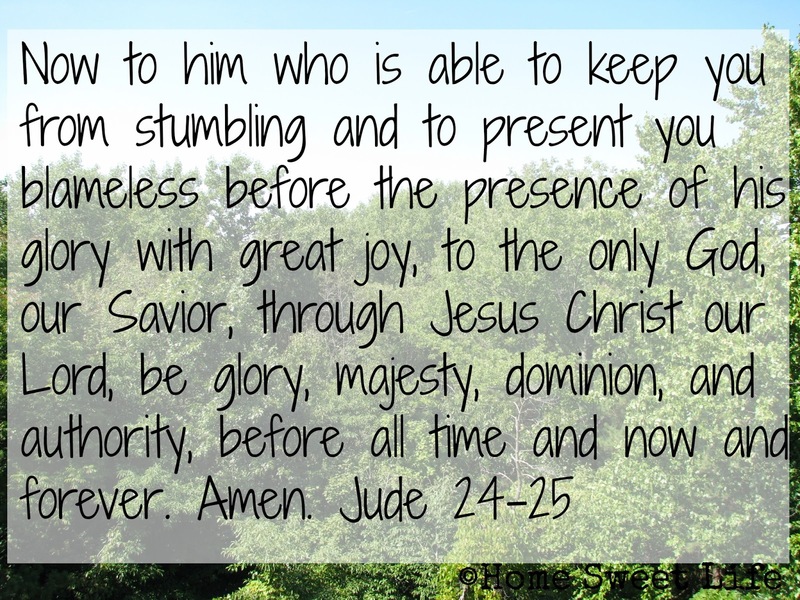 It is physically, emotionally, and mentally impossible for me to provide everything my family needs on a daily basis - but it is not impossible for God. When I take just a few moments to do nothing, God reminds me that He is always there, providing for us. Some days the few moments lead me to go pull out my Bible, some times they're just a brief respite in the middle of a hectic day. Either way, they teach me to trust. Those moments also allow me a time to clear my head and focus on what IS important for me to provide to my family - love. I cannot work my way to Heaven, I can only get there through accepting Christ's completed work on the cross in exchange for my sins. Practicing the Joy of Doing Nothing for a few moments reminds me daily that the price has already been paid, the work has been done. It is like hitting the pause button on my over-scheduled life and remembering to see the forest past the trees. Do you need a pause button for your daily life? Go find a flower, or a sunset, a river or a rock. Spend a few minutes appreciating God's handiwork in creation while you do nothing else. Find the joy of doing nothing for a few moments while you focus on the God Who loves us and provides for our every need. It is our biggest reason to be thankful! If our home schooling journey has a motto, it would be “Life is a Field Trip!” We have included experiential learning as much as possible since even before the girls were school aged. Imagine our delight when we found out that Apologia Educational Ministries was producing a journal for all kinds of field trips! Arlene has been reviewing the new Exploring Creation Field Trip Journal this Spring, so I’ll let her tell you all about it! 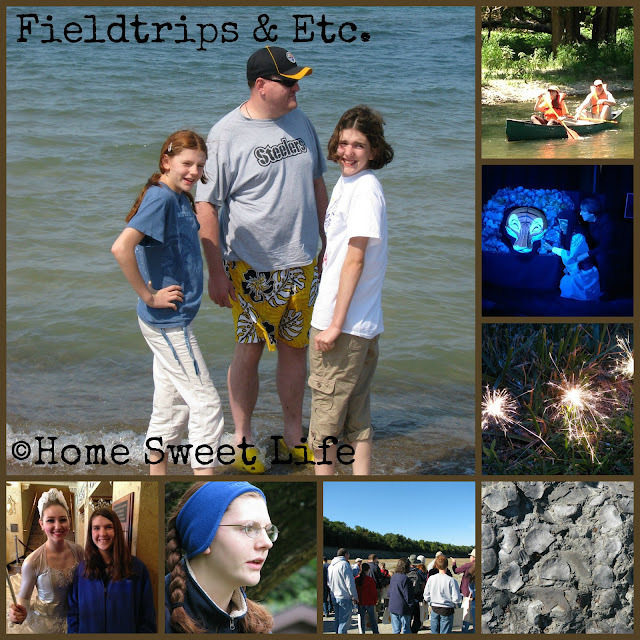 As a homeschool family we go on a lot of field trips. Some just for fun and others to go along with what we are studying for school. But have you ever wondered “ is my child actually learning anything? Are they seeing how this relates to what we have been learning in school? Or even in real life?” Well worry no more! Now there is the Apologia Field Trip Journal (and don’t worry about your kid who dislikes writing things down, this book is a fun way to write down what they saw without becoming boring or repetitive.) The field trip pages include a place to put when and where you went, then to draw a map, write down what books they read to go with the trip and draw or glue in a picture of their favorite thing from the trip. 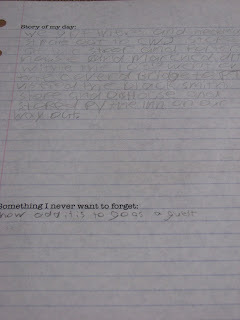 Then it has a space to write a paragraph about what they saw and a few sentences about their favorite part. This book is also great because it goes past just the standard field trip. Maybe your child has a “special spot” that they make a “field trip” to almost every day. This book comes with pages to record what they see. There is a page for every season from Fall to Summer. These pages include a place for a photo or drawing, a place to record the weather, and a place for notes, whether about what is around them or why it is their favorite spot. They also include a grid to draw out the special spot and what is around it. There is also How I See It pages which are for just that, they include some suggestions like movement, textures, 3-D, animals, the sky, the ground, and life. But it also has many blank As I See It pages so the child can draw whatever they want. It doesn’t have to be fancy or detailed but it doesn’t have to be simple either, that’s why it is how they see it. This 8.5 x 11” spiral bound journal can be used in your backyard, the local park, or on a trip across the continent. The book is designed for flexibility, yet makes great suggestions in the How to Use… pages. 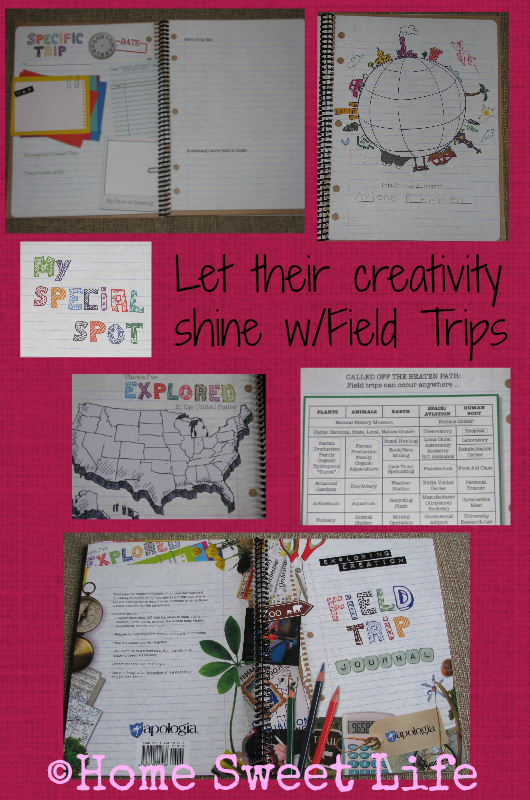 The beginning of the journal includes pages about preparing for a field trip, and over 100 field trip ideas. (Arlene counted and she has done 43 of these 108 trips sometime in the past.) There is also a link in the book that grants you access to Apologia’s extras page that contains links to about 200 more field trip places or ideas. 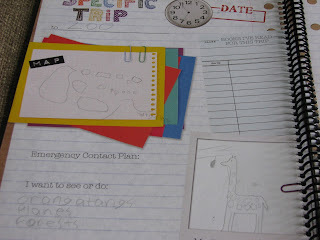 The focus of the journal is to give your children a fun place to record what they have seen and where they have been. There are pages for Places I’ve Explored in your state, the USA, and the world. Whether you’re on a berry-picking trip, or an adventure at the local zoo, your child can draw and write all about it in this journal. The pages in the front of the journal that focus on preparing for a field trip can be used for individual or group settings. They give hints on what the teachers and students should do to prepare: the week before the trip, the night before, on the way, and at the field. If you’ve been wanting to take your students on a field trip, but have been hesitating, wait no more. If you’re going hiking in a National Park, or going on a fossil hunt, you will obviously need to do more preparation than if you’re going out in your back yard to turn over rocks and look for bugs. Either way, remember your sunblock, insect repellent, and this journal! Arlene’s first comment was “why didn’t they have this when I was littler?” We have been so many fun places, fortunately we took pictures at almost all of them, so she can go back and think about which places she would like to go again, or what new places we should visit now that she is in High School. One of the links led her to a virtual tour of a museum in our state capitol that she is adding to our list for this Fall. Just to give you some ideas, places we’ve been in the past few years for field trips include: berry picking, jewelry shop, concerts, state fair, state parks, national lakeshore, powwows, historic sites, science centers, fossil hunting, courthouse, city hall, ethnic restaurant, ballet, symphony, zoo, aviary, aquarium, art gallery and museum, and a sports arena. We’ve also planted a butterfly garden, grown vegetables, ridden our bikes on the local trails, visited the library and the post office, and climbed trees in our own backyard. Since this is meant to be used in the field, don’t worry overmuch about spelling or handwriting. Arlene takes a long time to write things down, dysgraphia will do that to a person. 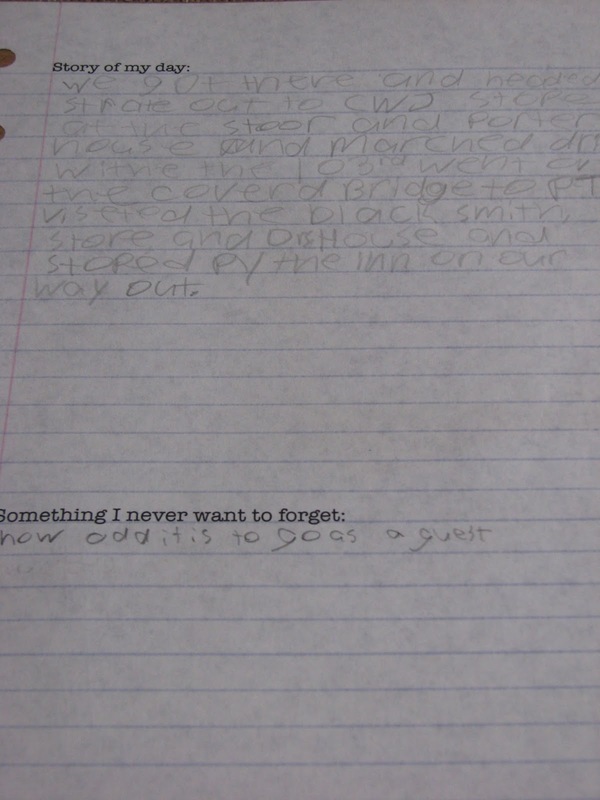 I was more interested in her recording her thought as they happened, than making this a writing assignment. This is their book, not yours. Let them use it to record what is most important to them. If they use a pencil, they can always go back later if they notice misspelled words. I appreciate the ability to adapt this book to wherever you are. Field trips do not have to be expensive, and they can happen in your own neighborhood. We have been on dozens, probably hundreds of field trips, over the girls’ lifetimes. Most of them cost us $10 or less. Every once in a while we save up and go on a grand adventure (meaning it cost $50 or more.) This Exploring Creation Field Trip Journal is designed to make recording the trip easy on your child. You can have one journal for each child, or use it as a family album. The My Special Spot pages encourage the child to focus on the beauty and changes in God’s creation, returning to the same location several times in a year. This combination journal/ scrapbook looks like a fancy spiral-bound notebook, but is made with card stock weight pages so the recorder can use a eraser if necessary. Use this book to record field trips, 4-H experiences, as a nature notebook and more. The 64 page Exploring Creation Field Trip Journal currently retails for $22, and would make a great addition to your young explorer’s toolbox! After all - Life is a Field Trip! 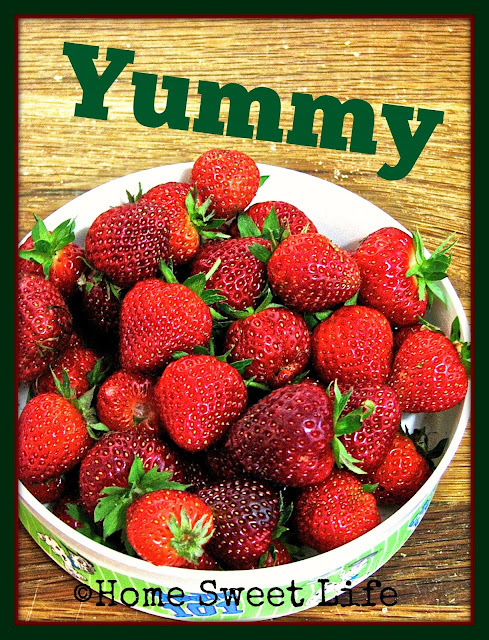 Thankful Thursdays - 6/4/15 - Yummy! The saying goes that a picture is worth a thousand words. 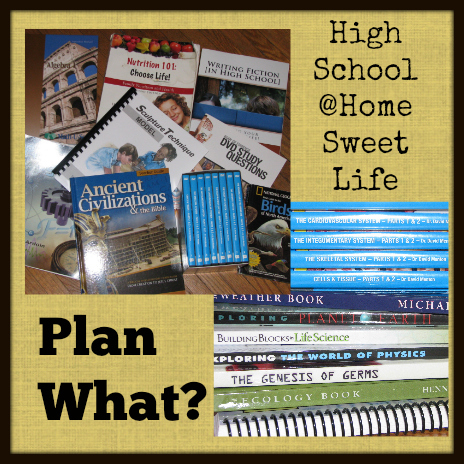 Homeschooling High School ~ What is it REALLY Like? 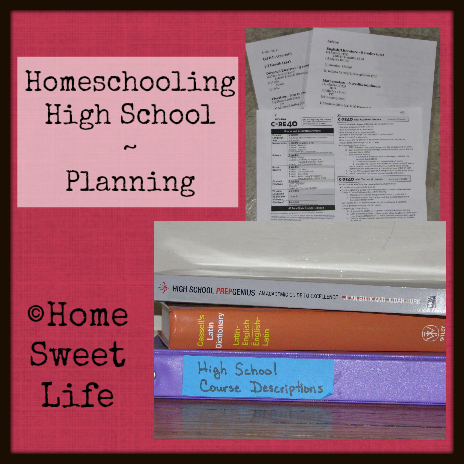 Over the past few years, I have been asked several times about Homeschooling High School. Other Moms and Dads want to know what is it REALLY like, and how is it different from the younger grades? I'll be the first to admit I don't have all the answers! To help you, and me, learn more, I'm joining with over a dozen of my blogging friends who are currently, or have finished, Homeschooling High School in a monthly blog hop. Beginning the end of June, we'll tackle a commonly asked question/ topic each month through December. With examples from various styles of teaching and learning, from around the USA and overseas, I think you'll want to make it a point to set aside time the last week of each month to read through these posts. Right now there are 17 of us joining in, and I expect the number of participating bloggers to grow. My friend Chareen, over at Every Bed of Roses, has helped organize us and set our topics to cover. October - How am I going to teach ____? November - How do you fit it all in? I'm getting excited just thinking about all I might learn from my fellow Home Educators. Surely I'll have a thing or two to share as well. Perhaps the thing I remind other Moms of the most is this: You know your children better than anyone else does. God is standing ready to guide you through these years, just as He had led you through the past - trust Him, and pray A LOT! My husband Kurt and I had vastly different public High School educations, neither of which would we want to recreate for Emily and Arlene. Each of our daughters has a course load tailored to help them through their weak areas, while highlighting their strengths. Our state's requirements are often met in creative ways, while hopefully allowing the girls to have fun learning more than just the minimum. For those of you new to Home Sweet Life, we are following a general Charlotte Mason philosophy, yet if you saw our daily lives you might say our style is eclectic experiential education. Life is a field trip! 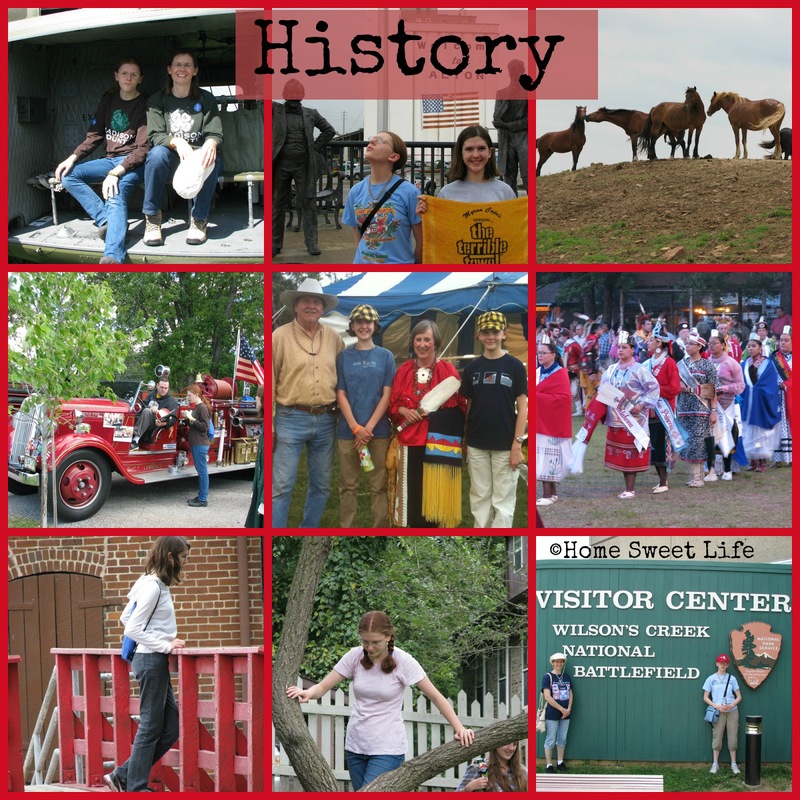 If we can do a hands-on activity, or go somewhere to experience a reenactment, we are usually the first to jump at the opportunity. We find fun ways to learn just about everything, and we're willing to try a lot of new options until we find something that clicks for each of our High School aged daughters. We hope you'll keep coming back! Click on the links below to meet our friends! Gena from I Choose Joy! Memoria Press is well known throughout most of the Homeschooling world as being a company that excels in Classical Education resources. Even if you do not consider yourself a classical educator, they have some great resources that work well with other teaching styles. Arlene and I have been reviewing The Book of the Ancient Romans Set this Spring. The Book of the Ancient Romans was originally written by Dorothy Mills in the 1920’s. This story-style teaching of the history of early Roman culture can work well with any living-book or read-aloud style of teaching. The accompanying Student Guide written by Matthew Anderson gives an opportunity for students to easily record what they have learned. Each lesson covered in the reading has at least two pages of facts, vocabulary words, and comprehension questions to answer. While not every student thrives on a workbook/ worksheet approach, each section in the Student Guide also has activities to complete. If your student is more of a hands-on type than a write-it-all down type then you will both appreciate these activities. Most, but not all, of the activities involve map skills - reading or drawing, and timeline building. Arlene will be the first to admit that she would rather give her answers orally than write them down. Since Spring always ends up being busier than planned around here, it was helpful to me for her to have a place to write down what she had learned that I could read through at my own convenience. The Teacher’s Guide includes all of the written answers for you, in case you need to be assigning a grade to your student’s work and don’t have time to read the book yourself. It does not, however, have suggestions for the mapping or timeline activities, so you should sit down with your student and have them explain those parts of their assignments to you. In the Student Guide, at the end of each of the five sections, there is a two page review section that helps your student get ready to take the exams found in the Teacher Guide. Since Arlene had already taken a course in Ancient History that included a section on Rome, I decided to let her skip the tests. The Teacher Guide also has a Final Exam available. The five parts of the Book of the Ancient Romans include four sections on the beginning, growth, and rise of the Roman Empire. The fifth section talks about the decline and fall of Rome. Since we follow more of a Charlotte Mason approach than a Classical one, we often skip written tests and have the girls present what they have learned orally. I don’t want Arlene to score low in a class simply because writing is difficult for her. This course for 6th grade and up from Memoria Press lends itself well to adaptation for your teaching style. It requires little teacher input to work well, and since all these books in the set are paperback, the cost for all three is only $39.95. I would recommend this for 6th-8th grade without the tests, and to use the tests either written or orally for those students in grades 9 and up. The review lessons in the student book provide the vocabulary words and their correct spelling, but you might want to consider allowing your student an index card full of difficult to spell names and terms for the exams. Unless you’ve been studying Latin and Roan history for a while with your students, they may have trouble remembering how to spell words like: Visigoths, Praetorian, Tiberius Gracchus, and reconnoitre. Arlene’s favorite parts of this course were reading the story, and the timeline and mapping activities. I appreciate the story approach to the text, as I was often bored reading my history textbooks that were assembled by committee. This story approach tells the same facts in a much more interesting format. Drawing a map, or learning to label places on one are valuable skills. As far as the timeline goes, The Book of the Ancient Romans does not come with one inside, so it is up to you to decide how you want your student to prepare theirs. 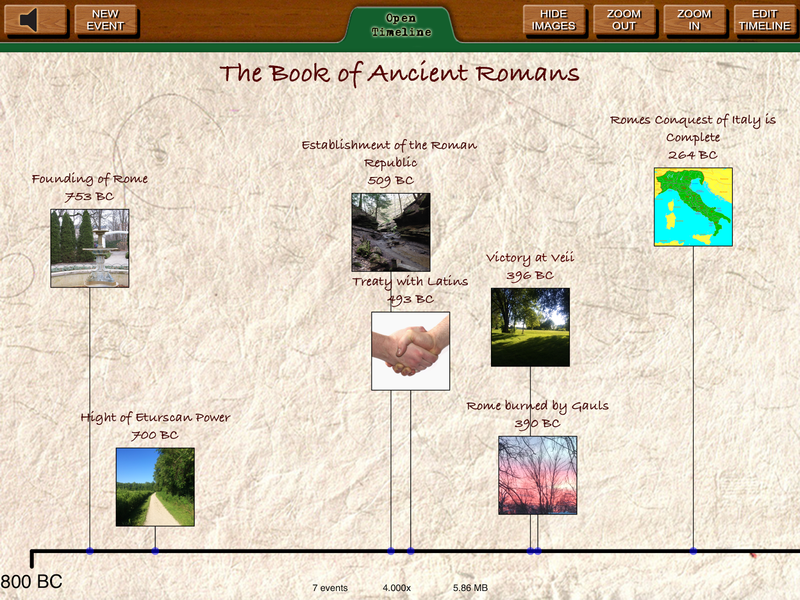 A couple years ago we had reviewed the Timeline Builder App from KnowledgeQuest. Arlene remembered it was still on our iPad and asked to use it for her timeline. This app works well because it is easily edited as more and more items are added to the timeline… no running out of page space worries here! It also has the feature of allowing you to choose which photo to assign to each event. Arlene can choose to use one of her own photos, or go looking for images to use for each event she adds. An average day included Arlene reading from the Text, then answering questions in the Student Guide. Some sections to read are as short as two pages, while others are more than 10 pages. This leads to a varying amount of time necessary for each assignment. You should look through the Student Guide before your child begins this course and decide if you would rather have then finish each assignment in a day, or work a specific length of time and have some lessons take more than one day. Certain sections may lead to additional questions about a specific person or event. If your student is getting excited about learning more, perhaps you can set aside one day each week for deeper research or to find an biography to read. 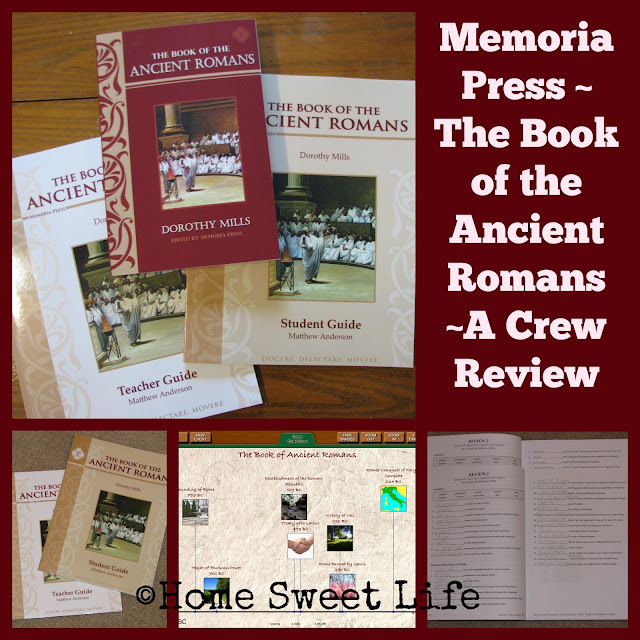 The Schoolhouse Review Crew has been reviewing three different curriculums from Memoria Press this time around. I encourage you to click on the banner below and read all the reviews!